Great fun – despite the perishing heat! 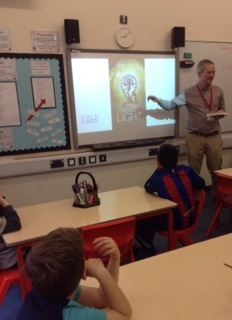 – talking to the children of St Paul’s book club today about The City of Light and all the places, people, animals and objects that inspired it. Lots of interesting questions! This entry was posted in Blog entries, The Secret of the Tirthas, Uncategorized and tagged author visit, book club, school author visit, st pauls book club on June 19, 2017 by Steve Griffin. I’ve just spent the last two days being reminded of the magic of children. Today is World Book Day, and I was given an opportunity to see again the magic of children when I undertook my first Author Visit to Class 3 of North Wheatley Primary School. I did a short reading, after which I was preparing myself for blank faces – only to experience quite the opposite. For the next half hour – and then again after break – I was answering dozens of interesting and intriguing questions from these bright and lively pupils. Should Lizzie have gone through the portal? Would I have gone through the portal? (And then I was caught out by ‘what’s your favourite song’!) I was bowled over by the depth of thought that the children applied to their reading. The morning finished with the children writing storylines for adventures through their own portals, and once again I was massively impressed by their imagination and creativity. Thanks to the Head teacher, Joanna Hall, for inviting me and special thanks to the class teacher, Kate Bailey, whose preparation made the session a real pleasure. 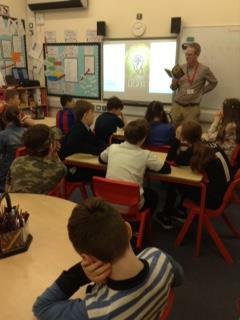 This entry was posted in Blog entries, The Secret of the Tirthas and tagged author visit, school author visit, world book day on March 2, 2017 by Steve Griffin.